I enjoyed this novel, however I didn’t fall in love with it like so many seem to have. 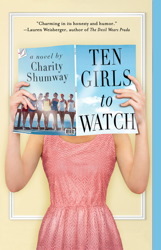 True to single girl chick lit, Ten Girls to Watch is a unique novel about finding oneself and following one’s dreams while frequently questioning the path taken. Ten Girls to Watch hooked me quickly, but unfortunately it gradually unraveled for me. I enjoyed the portrayal of Dawn struggling as a writer and artist in New York City, as opposed to the glorification of this storyline as portrayed in some popular medium, although by the end…well. Dawn’s luck seemed a little too unrealistic too me at times, however her constant questioning of whether she had made the right decisions resonated with me as I’ve been through the same process several times in my life. Part of my difficulty stemmed from how much power and decision making Dawn was given considering her lack of experience. Even that she was so involved with the video production struck me as a little unusual. I also had difficulty believing that these women would open up and share their life story with a complete stranger on the phone, even though I know that sometimes confiding in strangers can be easier. It never came across to me that Dawn had great ‘interviewing’ skills and the personality to get these women to open up as was stated later. It just seemed that as soon as she got them on the phone, they began rambling. I also took a bit of issue that all their stories were so positive, with such sunny outcomes. I kept reading wondering when we would find one woman that wasn’t happy with her lot in life, which would have made the novel much more realistic for me. I did enjoy the women’s stories, what their dreams were, whether they followed them and how they arrived where they are - although I had a difficult time keeping them all straight. I was disappointed at how they began to take over the story and how little was shown about how they impacted Dawn, as I was much more invested in Dawn than the women she interviewed. I didn’t completely love Dawn, although I liked her well enough. I cringed at many of her decisions regarding her ex-boyfriend and found her to be a bit too woe-is-me at times, and not entirely willing to pick herself up and move forward. Not always easy, I know, but sometimes I want a bit more of that than having events and circumstances just happen to a character. Ten Girls to Watch is an easy read (minus the aggravating delays my ipad took loading each chapter because of the photo profile of the top women it included to start each one). I liked the ending as there were a few surprises and not everything turned out as I expected, but I think it fit the story well. Overall though, I really enjoyed Shumway’s voice and writing style and will definitely read another.